Morning Huddle - Ochocinco to Miami? Meeting of the Minds: Who will win the Heisman? We're nearing the end of the first 10 games/events to be revealed in our journey through the best this country has to offer in the college sports arena through our MTB College Sports Bucket List and things have been interesting so far. I hope you've enjoyed some of the forgotten "big school" games and being introduced to some games you've probably never heard of before, but should of! Whoever says that only "big schools" can have rivalries that matter has never been introduced to this game that's for sure. If they had been then they are flat out lying because this game has everything you can think of to make it a must see at least once in your life. Plattsburgh and Oswego State are both state schools in the SUNY (State University of New York) system and are by bodies of water, but are separated by nearly four hours of travel time. That in and of itself makes it a bit interesting in terms of DIII "rivalries" which usually have a lot to do with geography. Plattsburgh is located just off of Lake Champlain on the border with Vermont and a scant 20 miles south of the border between New York and Canada (just 60 miles from Montreal), while Oswego State is located northwest of Syracuse directly on Lake Ontario. What makes this rivalry great is that both teams are very competitive in the SUNYAC (SUNY Athletic Conference) as well as on the national level. The Cardinals of Plattsburgh and the Lakers of Oswego State have met 98 times since their first meeting in 1975. The series is led by Plattsburgh 68-32-4. Plattsburgh has won 21 conference titles to Oswego's 8 and both have one DIII National Championships. Plattsburgh in 1987 (*vacated by NCAA), 1992, and 2001. Oswego has won just one, but it's the most recent, happening in 2007. These teams have met 9 times since the 2001-02 season in SUNYAC tournament finals, including this past year. In fact the past year was typical of this rivalry as of late with Oswego winning a regular season meeting, tying the other, and losing to Plattsburgh in the SUNYAC finals. 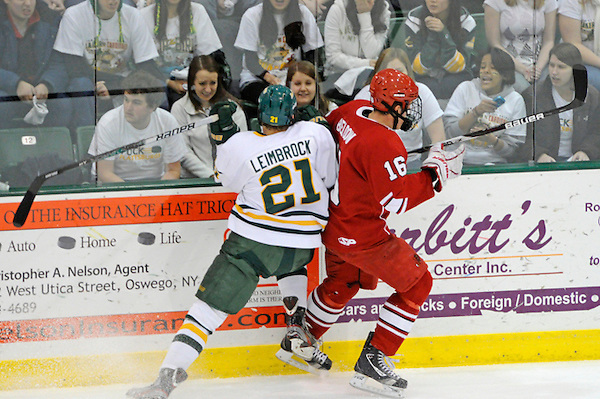 Plattsburgh would lose to Amherst in the first round of the NCAA DIII tournament. Add in the fact that there are many layers of fan hatred coming from both sides and you get an annual game at both schools that rivals what you see at any DI rivalry and no, not necessarily on a smaller scale either, especially in hockey. Both teams regularly sell out their arena's for this game which seat between 2,800-3,000 people on a given night. Not too shabby for a DIII game huh? There is a ton of fan tradition, but this rivalry was really sparked when the "pioneer" of Oswego State Lakers hockey, Herb Hammond (176-122-5), left to coach at then budding rival Plattsburgh. The fans loved Hammond, so instead of turning their hate on him they upped the ante against the Cardinals of Plattsburgh, but he only lasted two years at the rival school. Add in a few thousand tennis balls and some bagels and you've got a creative fan set of traditions. Unfortunately those two don't exist anymore, but the back story gives you a great idea of the level of fan interaction with this rivalry. Back in 1990 the Cardinal Booster Club got the idea to throw tennis balls on to the ice after the first Plattsburgh goal. The idea behind the throwing of tennis balls is the stuff that makes any rivalry on any level matter, it's origin can't be traced to one specific thing. It may have referenced the fact that Oswego's hockey coach also doubled as the tennis coach or it could've been that the balls matched the color of the Oswego jerseys or it could be in reference to the fact that the Oswego tennis coach had left for that same post after the 1989 season to the same post at Plattsburgh. Of course you would expect retaliation, but it wouldn't come until the 1998 season when Oswego went to Plattsburgh and blanked the Cardinals. During the return game that season at Oswego the Lakers fans threw bagels on to the ice after the first Lakers goal, signifying the "zero" shut out that they had put on Plattsburgh earlier that season. Personally this is a game I had way higher on my list as it's one of the most intense games on the DIII level and may well be the best DIII hockey rivalry in the country. But again, I'm not the one solely responsible for this list and I totally understand the understated nature of DIII games. Tomorrow we give you No. 91 and thus completing our first 10 games in the MTB College Sports Bucket List. We hope you've enjoyed the beginning of our summer long journey and would love your feedback, so leave comments below and let us know if you think we got these games right, wrong, or completely indifferent! @cmcasarez stole our thoughts... Coming in the following week!! RT @YahooForde: I'm thinking Butler, VCU, George Mason and Boise State are applauding the Stony Brook Seawolves right about now. Copyright © 2012 www.MadTownBadgers.com - All Rights Reserved - Trademarks used herein are property of their respective owners.